Kick up the flavor of your beef with this incredibly flavorful recipe for Steak with Bourbon Mushroom Sauce. You’ll be savoring every single bite and licking your plate clean! 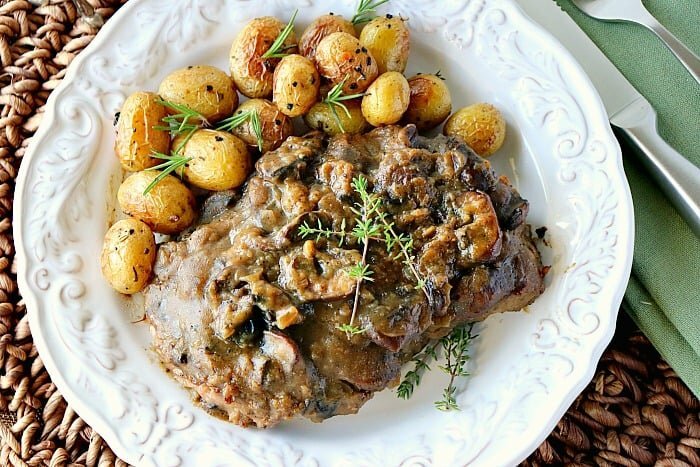 Buttery bourbon mushroom sauce is the perfect compliment to a thick, juicy steak! This steak with bourbon mushroom sauce for steak is buttery, bourbony, and bet-your-bottom-dollar, THE BOMB! 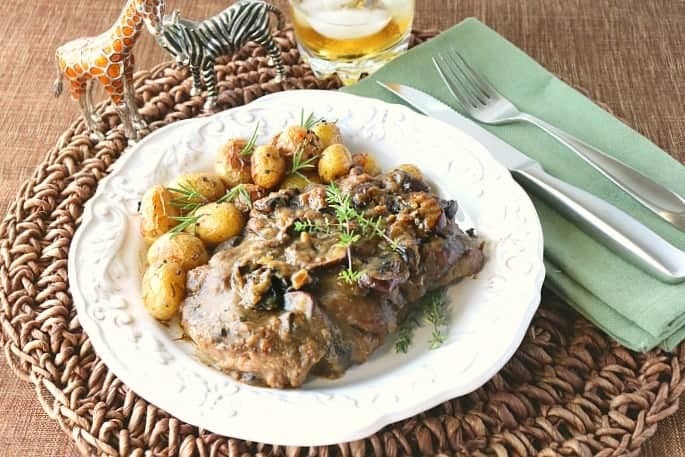 **Please Note – The printable recipe card with detailed instructions, complete ingredient measurements, and nutritional information for making this bourbon mushroom steak recipe is available at the end of this post. What are the internal temperatures for cooking steak to specific doneness? Don’t want to use (or don’t have) a meat thermometer? No problem. Here’s an easy way to check for the doneness of a steak without one. What can I substitute for the bourbon in the recipe if I don’t want to use alcohol? Great question, and I think you’re going to think I’ve gone off my rocker with this one, but try cream soda. Yes, you read that correctly! Cream Soda! The cream soda will give the sauce the same buttery flavor that the bourbon does, but without the alcohol. I do suggest, however, that if you’re substituting cream soda for the maple bourbon, that you still add about 3 tablespoons of maple syrup (or 1 teaspoon of maple extract) along with the cream soda just to give the sauce an extra depth of flavor and a light touch of sweetness. Why is cast iron the best pan for searing steaks? Once your cast iron pan is properly seasoned, it’s naturally non-stick. Cast iron pans have better heat distribution and hold the heat longer and better than other types of cookware. Cast iron leaches a small amount of beneficial iron into foods cooked in them. Iron is, unfortunately, lacking in the female diet these days and cooking with cast iron can help maintain healthy iron levels for women. A proper sear is best from a cast iron pan. A deep dark color and crust can be achieved in less time using cast iron. Cast iron is affordable and long-lasting. You can easily hand down a cast iron pan from generation to generation. If you’re lucky enough to have your grandmother or great-grandmother’s cast iron cookware, hold onto it. It’s a true treasure!! Wondering how to properly season and store your cast iron cookware? Here’s Martha to give you a quick lesson. For additional information regarding seasoning and care for your cast iron cookware, this article from Lodge Cast Iron covers it all! Here are a few side dishes and dessert suggestions to go alongside this recipe. Add the steaks which have been seasoned with salt and pepper to the skillet and sear well on both sides (approximately 2-3 minutes per side). Remove the steaks from the skillet, cover, and keep warm. While the steaks are searing, mince the shallots and slice the mushrooms. Reduce the heat under the skillet to medium and add the mushrooms and shallots to the pan, stirring well. Make sure to scrape the browned bits (from searing the steak) from the bottom of the pan. Cook, stirring occasionally, for 2 – 3 minutes. Add the butter and the all-purpose flour to the skillet. Stir well to coat the mushrooms in the flour, and cook for 1 – 2 minutes. Add the beef broth (or stock) to the skillet and cook, stirring occasionally, for 2 – 3 minutes. The sauce will thicken slightly. TURN OFF THE HEAT and add the bourbon and the cider vinegar to the pan. Stir well. Turn the heat back to medium and continue stirring for an additional 2 – 3 minutes. Return the steaks back to the pan and cook to your desired doneness. 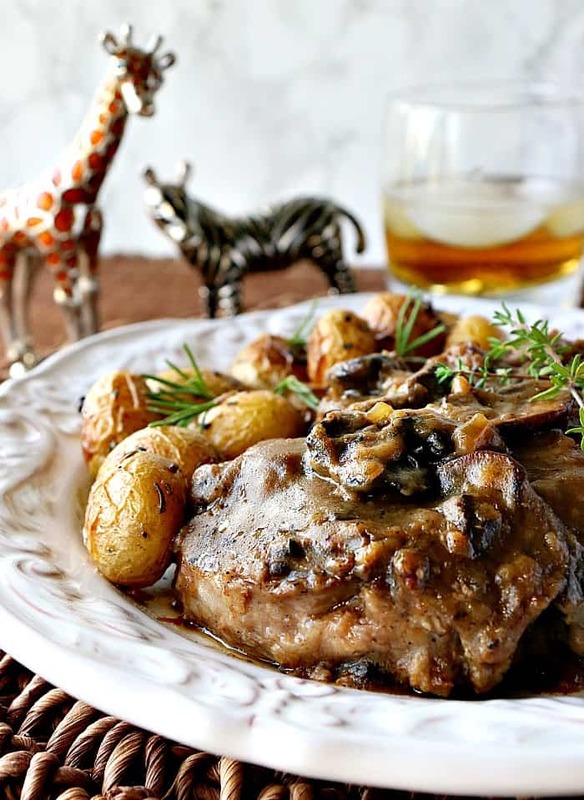 To serve, spoon the bourbon mushroom sauce over the steaks and enjoy! 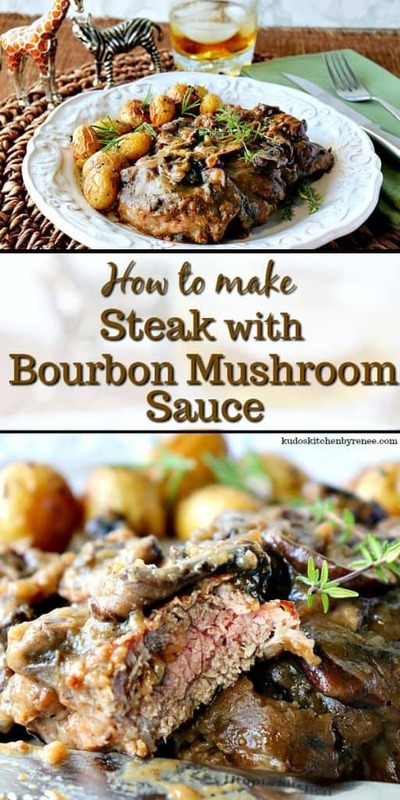 **The following affiliate links are some suggested products I’ve chosen that will aid you in the making and serving of this recipe for Steaks with Bourbon Mushroom Sauce if desired. Below is the printable recipe card for today’s Steak with Bourbon Mushroom Sauce. If there's ever a time when you want to take your steak dinner from plain to spectacular, but you don't want to fuss with fiddly preparation, this easy steak recipe is just what you need! 3 8 ounce strip steaks or your favorite cut, bone in or boneless. Season the steaks with 1 teaspoon salt and ½ teaspoon pepper. Heat a large skillet over medium-high heat. Add the oil and sear the steaks on both sides until browned. Remove the steaks from the skillet and keep warm. Reduce the heat under the skillet to medium. Add the butter, shallots, and mushrooms. Cook, stirring occasionally 2-3 minutes, making sure to scrape up the browned bits that collected on the bottom of the skillet from searing the steaks. Season the mushrooms with ½ teaspoon salt, and ½ teaspoon pepper. Add the beef broth to the skillet and stir well to combine. Cook over medium heat for 3-4 minutes until the sauce thickens slightly. Turn the heat off under the skillet and add the bourbon, and cider vinegar. Stir well to combine. Return the heat to medium. Add the seared steaks back into the skillet and spoon the bourbon mushroom sauce over the steaks. Cover and cook the steaks to reach your desired doneness. 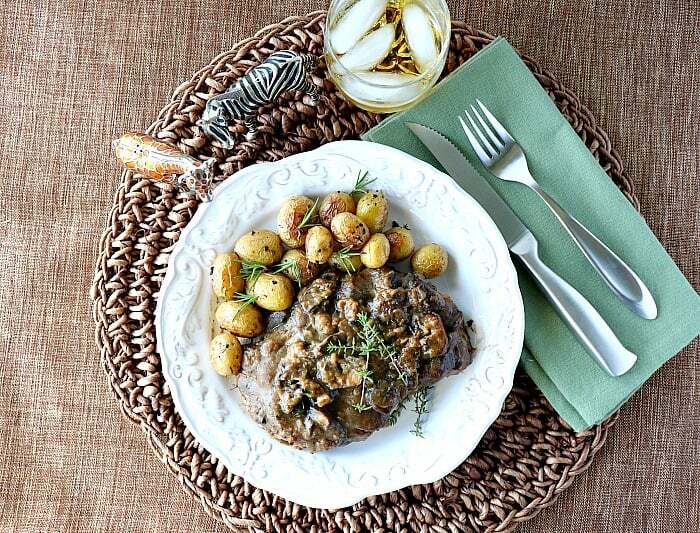 To serve, spoon the bourbon mushrooms over the steaks and enjoy! 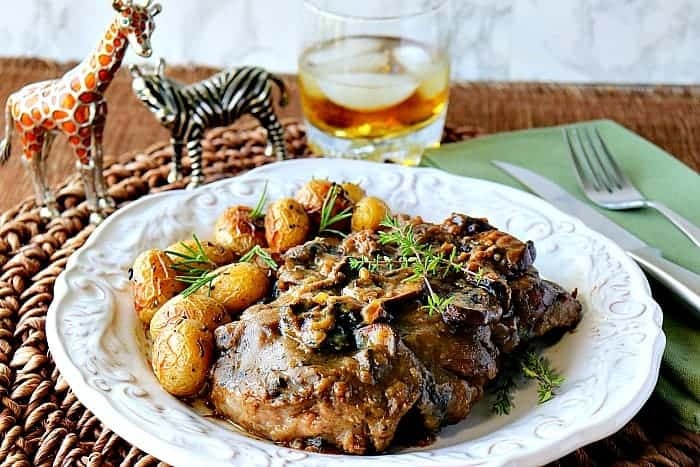 I sincerely hope you’ve enjoyed today’s easy steak recipe with its amazing bourbon mushroom sauce as much as I’ve enjoyed bringing it to you! 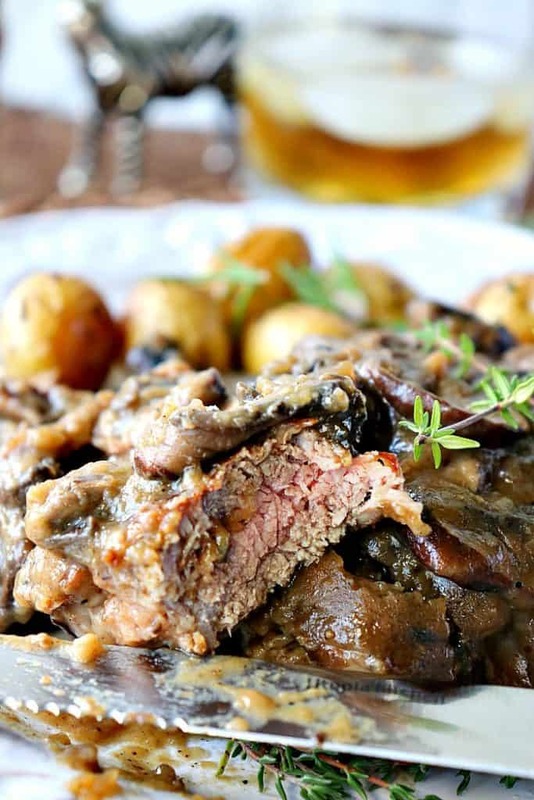 Steak with Bourbon Mushroom Sauce is everything a steak dinner should be! Thanks, Noelle! Even a steak purist can appreciate this sauce. Enjoy! What gorgeous mouthwatering photos! Makes me want to lick the screen clean. lol I love a steak with a good sauce and usually make a red wine sauce but I love the sound of a mushroom bourbon sauce too. I’m going to try it next time around. Thanks, Linda! I appreciate the comments regarding the photos. Thank you. 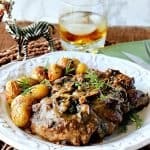 I know you’ll love the bourbon mushroom sauce. It’s my favorite. Enjoy!! I made this for dinner last night and it was a total hit! Thank you so much for sharing the recipe! What a lovely dish! The sauce sounds positively divine. And those itty bitty potatoes! Thanks, Sarah! It’s one of my husband’s very favorite steak and potato combos. Glad you like it!